A bill leadership claims removes educational bureaucracy passed overwhelmingly this week in the House of Delegates. Education has been a hot button issue this session, with teachers showing up on Friday to address concerns of a one percent teacher pay raise and public employee PEIA premiums. Earlier in the week, delegates debated a bill to attempt to eliminate educational bureaucracy. Chairman of the House Education Committee Delegate Paul Espinosa, R-Jefferson, said House Bill 4006 was a bill created in response to a 2012 Education Efficiency Audit presented during August 2016 interims. Espinosa said the legislation was crafted in order to make sure state tax dollars are better spent educating children. “West Virginia had one of the most top-down, heavily regulated systems ever encountered,” Espinosa said. Several lawmakers weighed in on the bill, some claiming it would limit the state’s outlet for student creativity. “If we do this right, we will actually make it more effective and provide more opportunity for the students of our state to learn,” said Delegate Marshall Wilson, R-Berkeley. Delegate Larry Rowe, D-Kanawha, said the bill reorganizes the executive branch and leaves no advocate for the arts. Delegate Shawn Fluharty, D-Ohio, voiced concerns over who testified before committee on just how the bill would impact certain programs. The bill passed 60 to 36 and will now be taken up in the Senate. As of 4:00 p.m. Friday, January 26, 2018, the 10th day of the regular session of the 83rd legislature 406 bills have been introduced to the Senate. Of those bills, 52 have passed and have been sent on to the House for further consideration. Senate Bill 10 would allow more local review and control over the setting rates, fees and charges for, municipal electrical power systems. It also clarifies the Public Service Commission’s. Senate Bill 51 would remove the reference to child support from the section of the code relating to the award of spousal support and separate maintenance. It allows the court to use the specified factors used to determine the amount of the spousal support or separate maintenance to also determine their duration. Senate Bill 163 is a rules bundle relating to the Department of Environmental Protection. Senate Bill 165 is a rules bundle relating to the Department of Health and Human Resources. Senate Bill 184 is a rules bundle relating to the Department of Highways. Senate Bill 237 is a rules bundle relating to the Tax Department. Senate Bill 242 the bill requires insurance providers in WV to provide coverage for long-term antibiotic coverage for Lyme Disease. Senate Bill 258 would exempt honorably discharged veterans from fees for license to carry deadly weapons. Senate Bill 267 would increase the salaries of certain state employees. Senate Bill 268 would eliminate the requirement certain agencies purchase commodities produced on institutional farms. Senate Bill 284 increasing access to career education and workforce training. The bill authorizes Advanced Career Education (ACE) programs for students in secondary schools. ACE programs connect students with community and technical colleges to offer college credit while still in middle and high school. It creates the WV Invests Grant Program which is a scholarship for WV residents who are 18 years or older with a high school diploma or the equivalent of, to attend WV community or technical colleges. The grant also requires students to stay and work in WV for two years after completing their degree. Senate Bill 285 creates legislation to allow two or more counties to create a regional recreation authority for off-highway vehicle trail riding. Senate Bill 324 would remove restrictions where certain traditional lottery games may be played. Senate Bill 327 will include in the extortions statute threats to obtain sexual conduct or the release of intimate body images. Senate Bill 338 changes the date that employers file annual reconciliation and withholding statements to January 31. Senate Bill 345 would authorize the DNR establish procedures and fee schedule for limited permit hunts. Senate Bill 350 would eliminate requirements that the Lottery Commission file racetrack video lottery game rules with Secretary of State. Senate Bill 357 would allow operators to be licensed as retailers in up to 10 locations, increase the maximum bet permitted for limited video lottery terminals and remove restrictions on bill denominations accepted by limited video lottery terminals. Senate Bill 336 will allow a someone while applying for or renewing a driver’s license to choose to add an additional fee of $3 which will be directed to the Department of Veterans Assistance. Senate Bill 384 reappropriates funds from the Department of Health and Human Resources' Child Care Development and Medical Services and the Bureau of Senior Services to the DHHR's Institutional Facilities Operations and Social Services. Senate Bill 385 reappropriates excess funds from the Department of Health and Human Resources' 2018 Fiscal Year budget and transfer them to the Department of Military Affairs and Public Safety. Senate Bill 386 reappropriates excess funds from Marshall University’s School of Medicine and transfer it to Marshall University’s general funds. Senate Bill 388 reappropriates excess funds from the Department of Health and Human Resources' 2018 Fiscal Year budget and transfers them to the Department of Administration. Senate Bill 94 would prohibit counties from regulating fireworks. Senate Bill 108 would create the Volunteer Firefighter Appreciation Act of 2018. Senate Bill 102 would create Creating WV Uniform Fiduciary Access to Digital Assets Act. Senate Bill 141 would expand county assessment and collection of head tax on breeding cows. Senate Bill 181 is a rules bundle relating to MAPS. Senate Bill 360 would clarify the royalty owed in an oil and gas lease. Senate Bill 361 would relate to the treatment supervision under Drug Offender Accountability and Treatment Act. Senate Bill 371 would relate to the proceedings for voluntary custody for examination. Senate Bill 429 would relate to forest fires. Senate Bill 475 would relate to the Industrial Hemp Development Act. House Bill 2546 (allowing replacement costs of employer provided property to be deducted from an employee’s final paycheck if the property is not returned) allows uniform costs to be deducted from an employee’s final paycheck if the uniform is not returned. House Bill 2612 (repealing section relating to unattended motor vehicles and penalties) repeals the criminal penalty for leaving a vehicle running unattended. House Bill 2799 (prohibiting the superintendent of schools from requiring a physical examination to be included to the application for a minor’s work permit) prohibits the superintendent of schools from requiring a physical examination to be included to the application for a minor’s work permit unless it is required by the prospective employer. House Bill 2831 (relating to the reconstitution of the Driver’s Licensing Advisory Board) reconstitutes the Driver’s Licensing Advisory Board, to require one member of the board to be a licensed neurologist in this state, to require the board to respond to requests of the commissioner when necessary in the discretion of the commissioner, to delete obsolete language. House Bill 4010 (providing no requirement to perform or host a marriage ceremony that does not conform to sincerely held religious beliefs) provides that a religious representative or spiritual assembly, church or religious organization is not required to solemnize a marriage. House Bill 4138 (requiring certain public or private schools and daycare centers to install carbon monoxide detectors) requires all schools and daycares that use a heating system or other device that emits carbon monoxide to install a carbon monoxide detector. House Bill 4183 (relating generally to standardized testing requirements for nonpublic schools) remove certain restrictions on achievement tests that must be administered to nonpublic students. House Bill 4233 (relating generally to fraudulent transfers) establishes that a presumption imposes on the party against which the presumption is directed the burden of proving that the nonexistence of insolvency is more probable than its existence. House Bill 4242 (clarifying the jurisdictional amount for removal of a civil action from magistrate court to circuit court) clarifies the jurisdictional amount for removal of a civil action from magistrate court to circuit court. House Bill 2655 defines and establishing the crime of cyberbullying. This bill will be on third reading Monday. House Bill 2662 prohibits the waste of game animals, game birds or game fish. This bill will be on third reading Monday. House Bill 2696 relates to crossbow hunting. This bill will be on third reading Monday. House Bill 4162 grants authority to the State Conservation Committee to contract for flood response. This bill will be on third reading Monday. House Bill 4199 permits a nursing home to use trained individuals to administer medication. This bill will be on third reading Monday. House Bill 4251 permits employees of baccalaureate institutions and universities outside of this state to be appointed to board of governors. This bill will be on third reading Monday. House Bill 2693 relates to state ownership of wildlife. This bill will be on second reading Monday. House Bill 4156 establishes the qualifications of full and part time nursing school faculty members. This bill will be on second reading Monday. House Bill 4230 relates to credit for reinsurance. This bill will be on second reading Monday. House Bill 4329 requires pawnbrokers to providing certain information to law-enforcement agencies. This bill will be on second reading Monday. House Bill 2654 expands county commissions’ ability to dispose of county or district property. This bill will be on first reading Monday. House Bill 3020 relates to criminal penalties for the offenses of hunting, trapping or fishing on the lands of another person. This bill will be on first reading Monday. House Bill 4175 prevents a requirement that an advanced practice registered nurse participate in a collaborative relationship to obtain payment. This bill will be on first reading Monday. House Bill 4178 permits certain portions of certified nurse aide training to be provided through distance learning technologies. This bill will be on first reading Monday. House Bill 4275 relates to the law-enforcement authority of the director and officers of the division of protective services. This bill will be on first reading Monday. House Bill 4359 relates to the removal of animals left unattended in motor vehicles. This bill will be on first reading Monday. 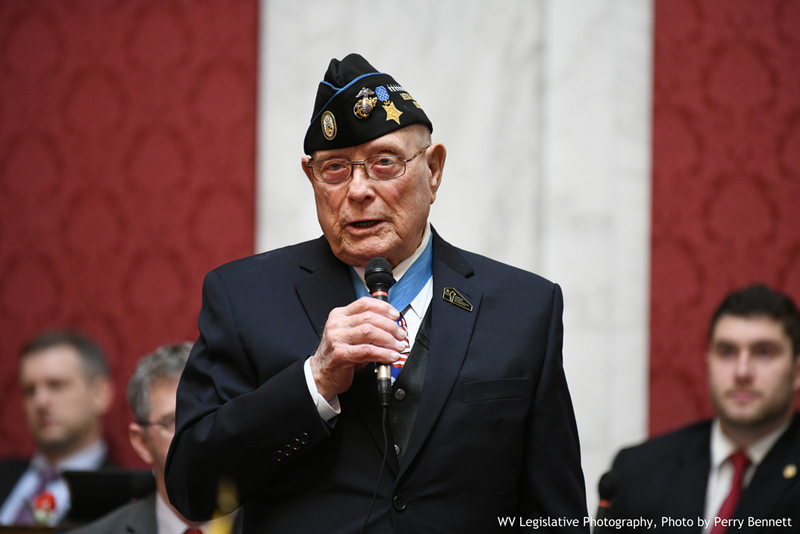 World War II Medal of Honor recipient Hershel “Woody” Williams spoke in both Chambers on January 24th following the adoption of SCR 6, which supports the construction of a Gold Star Families Memorial Monument on the Capitol Grounds, seeking to recognize the families of our fallen military heroes. This Sunday, Mr. Williams will be joining other medal of honors recipients and personally participate in the ceremonial coin toss prior to Super Bowl LII.